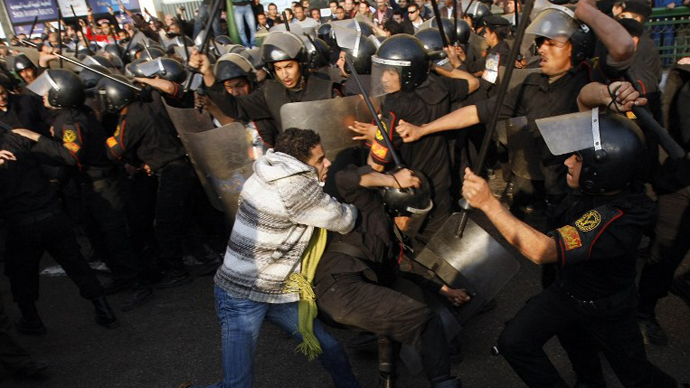 Egyptian police have fired tear gas on a crowd of protesters outside the Muslim Brotherhood's headquarters in Cairo. Dozens of people were arrested in a crackdown on the demonstrators. Egyptians turned out to condemn what they called an assault on journalists on behalf of the Brotherhood earlier on Saturday. 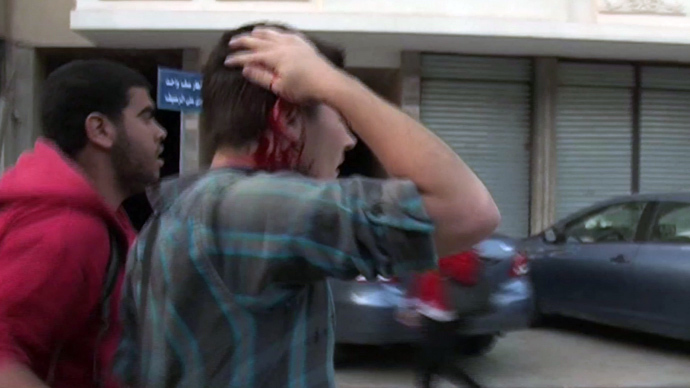 During the incident, several journalists, including an RT cameraman, were attacked outside the headquarters by Brotherhood supporters. Hundreds of protesters took to the streets of the capital Sunday afternoon, chanting slogans against President Mohamed Morsi and the Islamist group from which he hails. Some of the then were holding banners which read, "Down with Brotherhood rule." The demonstration turned violent after a group of protesters tried to break through security forces which were guarding the group's headquarters. Officers used teargas to disperse the crowds, while protesters set tires on fire in the street. The newly elected head of the Journalists' Syndicate, Diaa Rashwan, condemned the attacks and called on Brotherhood Supreme Guide Mohamed Badie to apologize. He also urged Egyptian President Mohamed Morsi to condemn the assaults. Rashwan did not rule out that the violence against journalists had been carried out under orders from the Muslim Brotherhood's leaders; the reporters were covering a meeting between Brotherhood Supreme Guide Mohamed Badie and Hamas leader Khaled Meshaal. At the same time, Brotherhood spokesperson Yasser Mehrez, has denied that his members intentionally attacked the journalists. 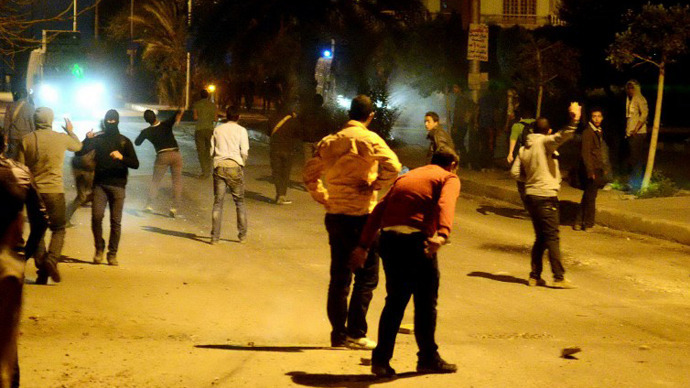 "Clashes erupted because some people tried to break into the Brotherhood’s headquarters. The young members of the Brotherhood did not intend to assault journalists or anyone else,” Ahram Online quoted Mehrez as saying. “Everybody has freedom of expression and the right to protest, but insults and sabotage are unacceptable." The Muslim Brotherhood insisted that guards outside the headquarters were provoked and insulted by the activists and journalists. Reporters said the assault took place after activists sprayed anti-Brotherhood graffiti on the ground outside the headquarters; Brotherhood guards retaliated with sticks and chains. RT’s Mohammad Moukhtar, cameraman for the Arabic department, was among the crowd of journalists filming the activists drawing graffiti. He sustained a head injury while he was trying to protect his camera as a gang of men armed with sticks and knives attacked a group of activists and journalists. Despite Mohammad’s efforts, RT’s camera was broken and stolen. The latest violence against journalists comes amid unceasing unrest in Egypt, with anti-government protests being staged in the capital Cairo and across the entire country. Sunday’s protests at the Journalists' Syndicate in downtown Cairo was the first of three demonstrations the journalists plan to hold. They will gather at the prosecutor-general's office on Tuesday, and outside of the Brotherhood's headquarters on Wednesday.